I am 12 stone with a recent hip replacement and shoulder problems ( side sleeper) hubby 17 stones backproblems and back sleeper . Would a split tension mattress be a good idea? Your body weights dictate that you would need to opt for a dual spring tension of Medium and Firm. We can offer dual spring tension with any model in our Artisan range in sizes King and above. 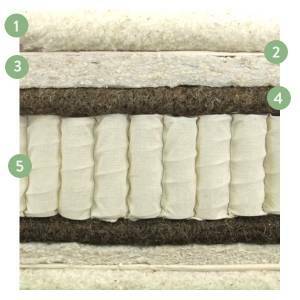 You will most probably find that the reason you are experiencing so much pain is because your mattress is much too firm, with the hip, shoulder and back problems you have mentioned I would recommend that you look at a model with a medium upholstery/ feel. The Artisan Naturals is our most popular, unbeatable model with 85% natural fibres. Containing a huge GSM of fillings, including wool and mohair, on a Calico Pocket spring unit. This medium feel hand crafted mattress is where we stake our reputation as ‘The Mattress Specialists’. The closest comparison we make to this model is the Vi Spring Regal Superb, which you can find in a Furniture Village showroom to try out. 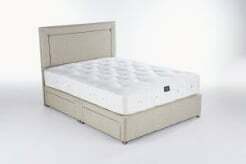 It would cost £1235.00 for a Kingsize mattress with a dual spring tension. This is priced particularly low in comparison to more established brands in order for us to set the bar in comparing branded mattresses with similar components. If this is in the region of your maximum budget then you will be getting the best mattress you can buy. Please view the recommended mattress and give the office a call on 0161 437 4419 to discuss this further.